Evolve College is dedicated to your experience as a student with us. At Evolve College, our hand-picked training team is focused on a depth of care for you as a student. Our Student Admin Team is here to offer you support and mentoring as needed – and to us this is not just talk – it is our very focus. Our teaching style and our learning materials reflect our dedication to you and your experience with us, and what you take away with you when you graduate. To us, your learning is about so much more than ticking a box. It is about developing you as a person. Evolve College is a Registered Training Organisation (RTO Number 41035). The Evolve College founding team has more than 20 years' experience in massage education. Evolve College’s focus is on the student, and it offers amazing massage courses which over time will be greatly expanded to cover study in many different fields and industries. Our purpose is in true education. We bring this to massage, knowing that it is not only skill that makes a quality massage therapist - it is everything the massage therapist brings into the treatment room, including the level of integrity and professionalism they bring to all of life - as all of this adds up to the quality of the client's experience with them. We applaud Evolve College students, who have a most unusual mix of commitment, diligence and willingness to do what it takes. They bring much to their study and to massage, and we work together with our students to set a standard of professionalism in massage that is ahead of the game and continues to transform the massage industry, as our founding team has been instrumental in doing for 20 years. We live our own lives with integrity so that we may bring the same integrity and quality to our students and all who come into contact with our College. We know that a college can talk the talk, but it is the lived commitment and quality of its team that is what makes what they say actually mean anything. We are powered by a joyful commitment to hard work, focus, determination and to service. We are always accessible to our students and will go out of our way to ensure that all students are welcomed into a positive and encouraging learning environment. We value all of our students and their individual needs, as well as their own plans for what they want to do with massage on graduation. We give our students control and freedom of choice about their mode of study and flexibility to change if/where needed. We respect ourselves and all others, recognising individual differences and valuing diversity of experience and opinion. Through our depth of care and detail in training, we work with our students to build professional competency and personal confidence. Our carefully designed clinical program fosters skill and confidence in our students, stepping them in their development towards being a qualified massage therapist at the end of their training. We are constantly refining our learning program and materials, to ensure that what we bring our students is the very best possible. Our attention to detail is unrelenting and we have an absolute commitment to the best interests of our students. 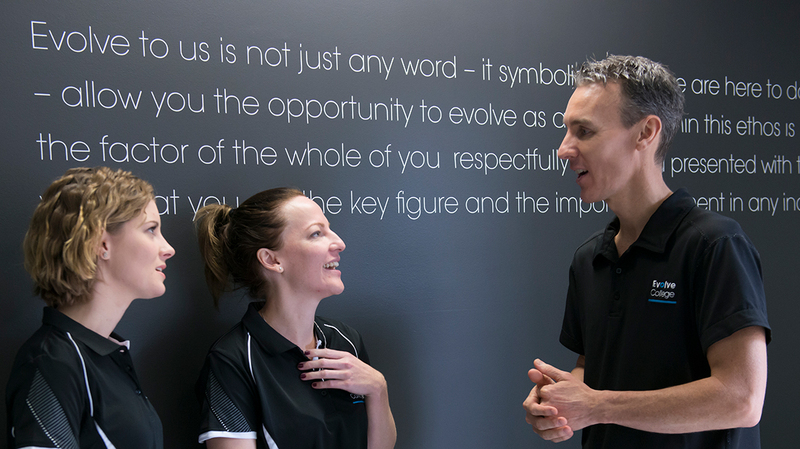 We have substance, developed through life experience and a solid history in developing massage professionals. We have a youthful vigour adopting a fresh and energetic approach to massage education. Our energy is clear for all to feel in every encounter they have with us. We are positive and optimistic about our future. We will seize every available opportunity and continue to develop, whilst not losing sight of our origins. We have an uncompromising commitment to honesty, integrity and transparency throughout our business and in every business interaction. We offer an unparalleled learning experience and opportunities unlike any other massage training institution. Our core focus is developing exceptional massage professionals, today and into the future, who offer true quality in massage therapy, and thus complementary health-care, to the public whom they serve. All of this is set within our core ethos, which is that true education is about development of our students as people - and thus our students' experience with us, in every respect, is of the utmost importance to us.